Not a bad place but lacks atmosphere and the beer is very average. Not really a typical London pub nor a trendy bistro pub, tries to be both and fails to be either. Average, could be better. Decent little pub just off Jermyn Street. It's a Taylor Walker pub (a brand of Spirit) so it's very much like all the other Taylor Walker pubs in London. Not that this is a bad thing, just don't expect too much individuality. On the other hand, not being tied to a brewery means there is quite an interesting range of beers. Youngs was there as was Old Golden Hen from Green King, which I'd not seen before. I can't remember the others, but there were quite a few more. Staff seemed pretty friendly. I was in a big group and a good time was had by all. They had GKIPA, Pride, Young�s Bitter and Spitfire on when I was in here. I had the Pride, which was OK. This is a small fronted, but medium sized pub tucked away off the beaten track down a side street off Jermyn Street. Service was friendly � the couple behind the bar both spoke with British accents. It was comfortable, and fairly quiet on the last Saturday before Christmas. Seems to be a good place to escape the crowds filling the nearby streets. I rather liked this pub. There was nothing outstanding about it, although I thought the leaded lights in the bar gantry, and in panels at the rear of the pub, were quite attractive. This is probably a good place to go if you fancy a quiet pint. A brilliant little boozer - it's hard to believe it's only 200 yards or so from Piccadily. Rather like Mayfair, St James's has quite a few decent pubs (how many are there - I can only think of about 5). This fairly typical but little known West End pub is a bit tucked away in the back streets and easy to miss (I only found it by accident while looking another pub). The interior is quite formulaic but with some nice touches like the coloured glazing in the interior screens and bar frame. The latticed windows, gas lamp and bookcases give it a cosy, homely feel whilst the Thetare posters and old black and white photos of local landmarks remind you that you are still yards away from the bustling West End. The false Tongue & Groove ceiling makes the place a bit more intimate and there is a small snug beside the bar. 4 Ales on offer, all rather standard - Adnams, Green King IPA, Pride and Speckled Hen but reasonably priced for the area. The usual fruit & quiz machines, TV and cash machine are all present. 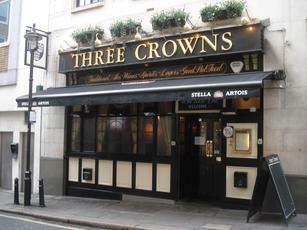 The Three Crowns basically does everything to satisfy the generic punter without being exceptionally special but if you are looking for a place in the area but off the beaten track (just 4 reviews and 8 ratings in 5 years for a pub in the West End seems unbelieveable) and not generally packed to the rafters with tourists, you could do a lot worse than here.